Scientists on an experiment at CERN announced today that there is more to cloud formation than previously thought. Their study, published in the journal Nature, looked at the effects on cloud formation of vapors and cosmic rays in the atmosphere. The results could help improve the accuracy of climate models. The CLOUD experiment at CERN studied the formation of new aerosol particles, tiny liquid or solid particles suspended in the atmosphere. These particles are thought to be responsible for a large fraction of the seeds that form clouds. Increases in atmospheric aerosol particles cool the climate by brightening clouds and reflecting sunlight away from Earth. The increased amount of aerosol in the atmosphere caused by human activities is thought to have offset a large fraction of the warming caused by greenhouse gases. Current climate models assume that sulphuric acid and ammonia, the vapors most likely to cluster together and form new particles, cause this particle formation with nothing other than water. But the CLOUD experiment found that these vapors account for only 1/10 to 1/1000 of new aerosol particles that appear in the lower atmosphere. Two groups of Americans participate in the CLOUD experiment: A professor and a student from California Institute of Technology and the company Aerodyne Research Inc. 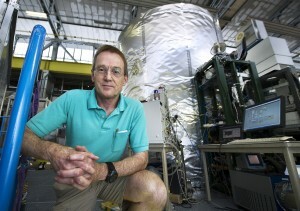 Professor Richard Flagan at Caltech provided the experiment with an instrument he had developed to classify the size of particles down to a single nanometer. Scientists in the CLOUD collaboration also studied the effect of cosmic rays on aerosol formation. They found atmospheric ionization caused by cosmic rays increased the formation of aerosol particles by up to a factor of 10, particularly in the cool temperatures above the lower atmosphere, where CLOUD has found sulphuric acid and water vapor can form new aerosols without the help of additional vapors. The result leaves open the possibility that cosmic rays could influence climate. However, scientists will need to determine what other vapors are involved before they can reach any conclusions about their role. Read the CERN press release on these results.